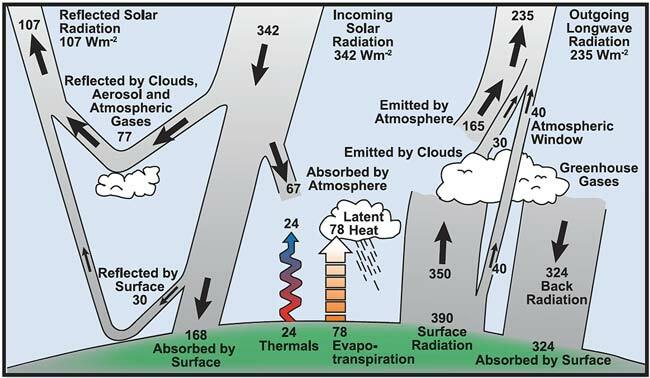 The Carbon Cycle below show the importance of the CO2 sink in cold surface water. More fossil fuel and less cold surface water will tip the balance. More warm outgassing surface water is catastrophic. Melting permafrost releasing methane and CO2 has to be added. The buildup of Methane Hydrates makes tings worse as I can se no safety margin. It made me add a growing number of comments and links on this page and Page 3. The change in climate can be huge. Hopeful enough people will realize what is happening before the forces of nature becomes too strong. July 2007 / Kaj Jensen, Ph.D.
A very little rise in temperature will be amplified by several nonlinear feedback loops. fig.2. 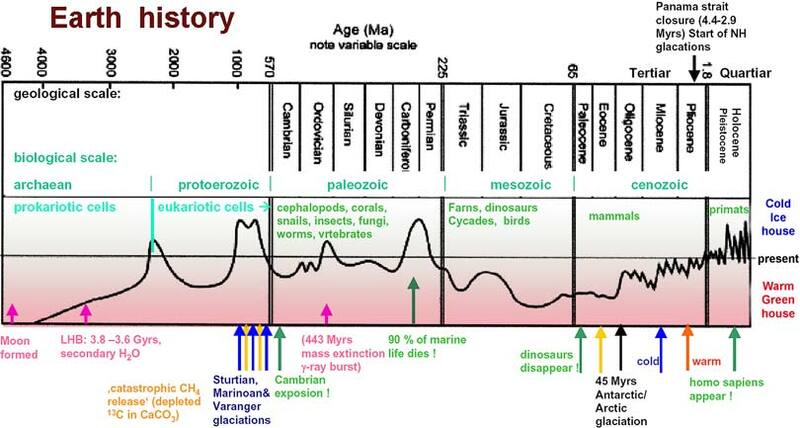 in this paper, illustrates the last 50 million years as a colder and colder period. The deep ocean temperature has especially gone down during the last 15 million years. It means time to rebuild and store huge amounts of methane hydrate protected under cold water. It is not stable any more as the rising temperature has reached a critical level. Extra heating is now turned on as humans are storing CO2 in the atmosphere - bad timing. - The detonation of such a huge "methane bomb" has the power to remove the ice caps. - It can be detonated by a smaller "Time bomb" trapped in Arctic soil. Higher temperature pulls the trigger. - "a second detonator" is a submarine landslide releasing methane e.g. triggered by earthquakes. - "a third detonator" is the Arctic sea-ice. The Carbon Cycle. - Modified Carbon Cycle. produce dense salty water, which sinks from the sea surface into the deep sea. Dense water transport CO2 down. 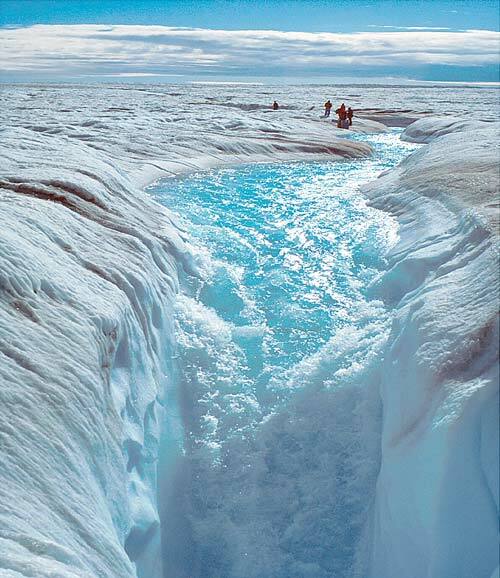 Meltwater is not dense. The CO2 take-up from land vegetation goes down, when the temperature goes up ! Carbon in the atmosphere is out of balance what increases greenhouse gases in the Energy Budget below. Earth's annual mean radiated Energy Budget. is warming the surface, melting ice and heating up the huge amount of water in the oceans. The energy balance is illustrated in this video. 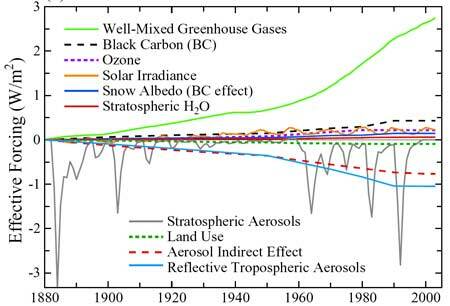 Aerosols did cover-up the increase in greenhouse gases for years. Man-made sulfates, smog, industrial fumes etc. still do. The burning of sulfur rich coal and fossil fuels do cover up part of the CO2 problem and produces damaging acid rain. Black soot from air pollution makes bright snow and ice darker so less sunlight is reflected - more warming. The big brown clouds hanging over most of Asia is a serious problem - video. Short winters with only little white snow reflects less sunlight - more warming. Less reflected sunlight by white polar ice, as it melts - more warming. Phytoplankton, the major CO2 sink start to suffer - more warming. More Wildfires - more warming until CO2 returns by grow back. More rot and fungi releases CO2 - more warming. Deforestation continue - more warming. Ocean turning to acid - more warming. Flooded land reflects less sunlight - more warming. Flooded permafrost melts and releases methane - more warming. Destruction of tropical peat swamps and old Wetlands - more warming. Increase in surface temperature increases water vapor as a greenhouse gas - more warming. Trapped under permafrost a huge amount of Greenhouse Gases starts to leak - more warming. white snow falls on land and on sea ice. Until snow is replaced by rain able to melt ice at an increased speed. Overpopulation continue - much more warming. The Threat to the Planet. Sea ice 1. Sea ice 2. Sea Temp 1. Sea Temp 2. El Niño. Mean Sea Level. The island of Tuvalu is already pleading for help - but it is doomed. Bangladesh is next. the left and the picture above can be taken as evidence. flip back to the old balance hot "greenhouse earth"
but it can not support 6 billion humans. The graphs of solar irradiance and cosmic rays has recently been quite flat. Slight lower Solar irradiance during the last 25 years did not cool the earth. but the orange curve above shows that it will contribute very little. More details are shown below. graph below ! - Very important - compare W/m2 to see what matters. Jupiter and Saturn changes, but the number can not go under zero. The low number of sunspots is equal to a cooler sun as long as it last. The Forcings above miss one factor - Global Dimming - it can make things even worse. to rise killing species every day. putting everything on the same scale in order to calculate the net effect. ice sheet growth in the Northern Hemisphere. heat up and down in earths history and it is easy to calculate. alterations has to be added if the "clock" is used over very long time. predicted by Jan Hollan - a little more warming in small steps. The last 10 000 year downturn were substantial, but the temperature did not fall. forcings must have been added beginning 8 000 years ago. CO2 and methane from agriculture and from the seabed may be the cause. falling insolation - no glaciation as the trigger were defused. The good thing is that a new ice age were stopped. and global warming, but further exponential warming is the way to mass extinction. years ago rising the sea level several meters above the present level. runaway as earths orbit made a sharp fall in summer insulation 65N. and the insolation became too low - se historical data on page 7 fig. 2.
by a sharp fall in insolation. Today there will be no further fall in insolation to stop a flip to "hot house". CO2 were a key factor last time earth were in "hot house" or warm greenhouse - Homo sapiens has not been there before. Eruption of a super volcano or sulfur dioxide from several volcanoes will cool the earth for a few years. cool the earth but a lot of greenhouse gasses will also be added and they remain in the air for centuries. outcome is uncertain as it depend on the actual event as e.g. the rapid cooling 12,900 years ago. making rapid climate change 11,500 years ago. Cooling is possible if we can takeout the pressure of volcanoes in a new controlled way bringing CO2 from volcanoes to a halt. more vulnerable to solar eruptions and radiation from space. metals, too deep to alter the geothermal heating, but at present changing probably for a "reversal" - not a halt. but many smaller local north and south poles will probably cover the earth during a reversal and give some protection. humans a chance to survive. Solar Superstorm's as in 1859 will make huge damage especially to electrical wires and electronics when the protecting field is weak. cracks in the earth's crust. The crust or "skin of the earth" is thin and delicate but may look solid within a short time period. break up and the tectonic plates will move more than usual. Traveling through "a not completely empty space" our solar system do hit high energy radiation, gas and particles. when our magnetic field is down during the coming "magnetic field reversal" or pole shift. The sun's magnetic field is also weakening what might partly explain the huge influx of more cosmic dust. of our galaxy and wobble up an down through the galactic plane. One revolution of the galactic arm containing our sun is about 225–250 million years. The Sun oscillates up and down relative to the galactic plane approximately 2.7 times per orbit. on all planets in our solar system right now - some of those changes are huge but not reported to the public. historic cosmic radiation in the path in space where planet earth travels. smaller local poles until a full pole shift. It may have started 150 years ago and be in process. Derbies from our galaxy and remains from a colliding galaxy may hit planet earth periodically like comets orbiting the sun. It probably add to global warming and so do cosmic rays and a cloud of fine cosmic dust becoming extra fuel thrown on our sun. the means available to us to survive and to take care of other species. What else can we do. Comments as "all planets are heating up - it is not just the earth" is useless as we have to stop runaway heating. Do You like to enter a plane if you know there is a 5% chance of a fatal crash ? - Do You like to travel with "spaceship earth"
if you know that there is a 5% chance that it is on the edge of turning extreme hot like Venus ? that humans/CO2 is not to blame. "point of no return" for human life on planet earth using all means to protect precious living species including ourselves. secondary by moving clouds of dust that might end up on the sun as extra fuel or as dust shields around the planets. The result can be major instant change in climate - warming or freezing. and setting off volcanoes as a warning. The 2004 Indonesian earthquake and Tsunami might be a small example of what is coming. harsh interstellar environment, especially from cosmic rays. It may be pushed inwards or even blown away by superwaves. Cosmic dust from those periodic small and huge superwaves are found in ice cores. The size of mass in our galactic center is so huge that major outbursts are hitting our rotating "gyro" earth very hard. Some superwave scientists have a theory of several degrees of abrupt change in the earth's rotation axis as a consequence. If so land masses at the new equator goes substantial up and the new polar regions goes down. The rotating earth is 25 miles / 41 km wider than it is tall . from huge amounts of charged particles. a large part of the electrical grid. People who cares about the future should at least get the electrical grid below ground before the next hit. is what it takes to fine adjust the galactic center to be exactly in front of the arrow of the star sign Sagittarius next to the tail of Scorpio. 0.1 Watt pr. square meter. However more heat are transmitted from the Mid-Atlantic area with a thin or missing crust. Heat from this source may be behind El Nino near the Galapagos Islands. CO2 from seafloor spreading is probably also low at this time in history and so is heating from Deep Sea Vents. Changing clouds will affect the climate in both directions depending on height, latitude and color. Ocean circulation is important as water is the main accumulator or buffer of heat. delay for heating up the deep sea. Outgassing of CO2, when deep sea water returns to a hot surface, will of cause also have a delay of several hundred years. CO2 and temperature are connected in an amplifying loop, meaning danger when both are high at the same time. The mixing of water in the oceans are complicated as described in this introduction. as melting from the bottom is a key element. Antarctica has already begun to melt from the bottom and from the edge. for many years, but 35 M years back in time there were no ice on Antarctica. 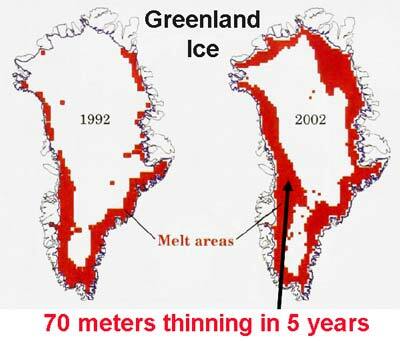 Disintegration of ice is what rises sea level fast when the process gain momentum. with high melting capacity as well as high transportation capacity. pump/hart for sucking in saltwater starting to melt ice from the warm end close to the seafloor. a mile or more below sea level. Central west Antarctica may turn into a new deep sea waterway across/under Antarctica. leaves free space when it melts, and so do huge amounts of "ice look-alike" methane hydrates in the seafloor. Evaporating methane hydrate in the artic tundra my also leave space to be filled with water. Wilkins Ice Shelf in Antarctica breaks up. Arctic Ice Shelf breaks up. If no action is taken, excess heat from the present unbalance in the earth's energy budget will have to go somewhere. The heat capacity of the atmosphere is insignificant - the energy has to go somewhere else. First it will heat surface water, put more water vapor in the air, melt permafrost and melt ice at a slow speed. and fueling more extreme weather. More rain falling on ice will speedup the melting. If the excess heat grows exponentially, things will happen faster and faster. at a higher speed, what expand water and rises the sea level further. Arctic relocation is limited by an expanding "ozone hole" hurting animals and plants. curves into "an exponential runaway growth" - very different from small linear steps each year. The man made CO2 may "only" be the trigger or igniter to release the huge forces of nature. to balance the climate in the small comfort zone between "hot house" and "ice house" - and act in time. The very small climatic variation during the last 10 000 years is not "normal" in the history of earth - humans were lucky. A small amount of extra CO2 and CH4 did probably stop a new ice age - very lucky. through the ages". No - only Homo Sapiens made it to our time and evolved especially during the latest 10 000 years. Our complex way of life is sensitive to a "runaway climate change" and the temperature approaches the "runaway trigger level". to the old hot "greenhouse earth" - not experienced before by "homo sapiens". end up with a poisonous hydrogen sulfide eruption - Take a look at the consequences from earths history. History has told that cooling will follow such a hot period, but chemical weathering of silicate rocks is a very slow process. Europe, as we have the high effect from greenhouse gasses and human activities. A later temperature drop to a new ice age can always be avoided just by adding a little greenhouse gas. However a stop in pumping CO2 saturated surface water down in the oceans by the "ATC-pump" is critical. will the most important transporter of heat - the wind. 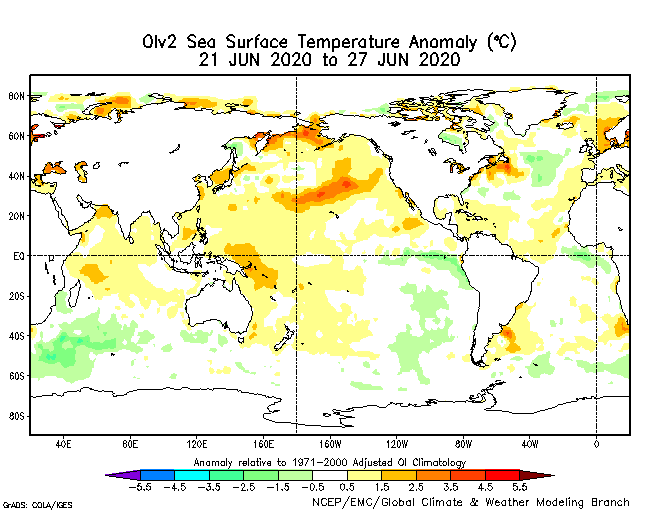 Local changes in sea current do not switch off the surplus heat - it is only stored somewhere else. 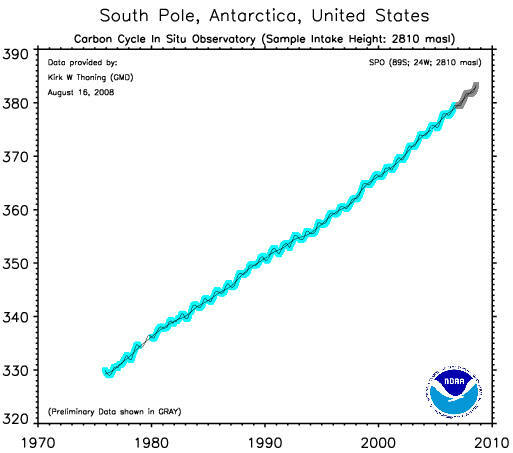 We need cold surface water to take up CO2 as shown by the blue arrows on the first graph on this page. from year to year. However upwelling cold water from the deep ocean can only continue as long as the supply last. deep ocean supply of cold water. At present we are in a cooling La Nina phase, but the temperature of the upwelling is turning up. - The temperature curve shows oscillations. Further historical data and forecasts are provided by noaa. If the upwelling stops permanently, we will be in deep trouble very soon. Loss of cooling and loss of food for phytoplankton. The effect of a permanent El Nino is comparable to one million power plants each producing 1000 mega watt - more warming. Air contain very little energy compared to water. A year with cold air or warm air temperature tells very little about the direction of global warming. Instead it reflects the temperature of upwelling water and the effect from "Brown Clouds". Less heat is radiated to space during periods with a low surface temperature. At present the 11 year sunspot cycle is in a cooling minimum. as more UV Light reduces the growth of Phytoplankton just like UV reduces the growth of plants on land. cooling until the industrial revolution in Asia added "the big Asian brown cloud" - masking the present warming. above average when the hot El Nino state comes back. - The rise in global surface temperature is only temporary stopped by upwelling cold water. A better indicator is the melting of ice shelves and glaziers from beneath by change in water temperature. total outgoing energy radiated from planet earth - the simple consequence is a rise in temperature. The best present monitor is the upper 700m ocean heat content measured by instruments. Another monitor is the actual concentration of a greenhouse gas in the air. or study the curves from important weather stations on the map - e.g. Greenland and northern Canada. Some experts has calculated 350 ppm CO2 in the atmosphere to be a safe level. been stopped - so far. as ocean acidification kills the food chain. ahead has to be understood. Can We Save Our Oceans from CO2 ? 350 ppm CO2 in the atmosphere is again the best estimate for a safe limit. The required CO2 cut, referring to page 25 in the pdf report, is a 25-40% CO2 cut below 1990 levels by 2020. In addition we also have to pay for leaking CO2 and methane from melting permafrost. Page 3 shows a very important figure of sea level versus temperature based on earths history. It is very different from what the press normally tells the public. Current predictions are short-term. Final equilibrium state may be as large as a 10–30 m sea-level rise per deg. C.
"Delivery" takes place with a delay, and we are sending new orders each year. It all adds up when delivered takes place. The heat content of the oceans is on the way up. The curve shows where a substantial part of global warming is going. It is probably most of the present unbalance measured to be 3.6 x 1021 Joules per year in the upper 700m. or each person on earth running a 10KW water heater full power non stop to heat up the oceans. More detailed data will be available in the future. It will tell the exact speed of global warming. for everybody to know those numbers without uncertainty. the oceans right away - why not publish the surplus heat in Joules every week without ambiguity. 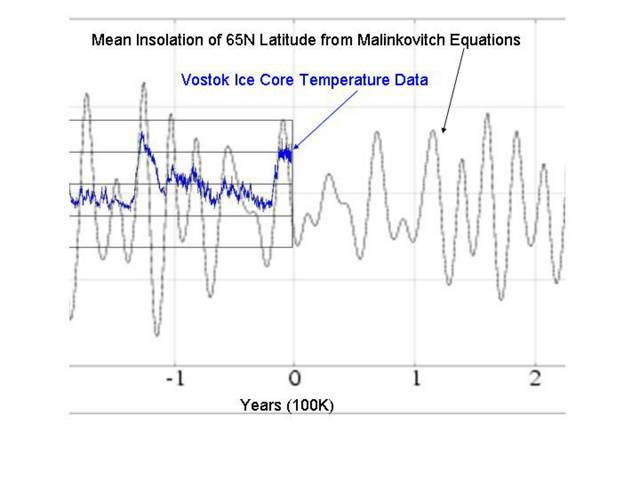 The resent drop in artic sea ice cover can also be calculated like sun panels for heating a house. from a sun panel the size of 2 000 000 000 000 square meters. The same magnitude as heating from CO2. Do your own calculations before accepting a higher temperature to be "safe". Methane is already starting to leak - it has to be added to the CO2 problem. Where will the present path take us ? Quarter of Species Gone by 2050 ? Is the Earth's 6th Great Mass Extinction underway ? We must learn from past experience 55 million and 251 million years ago. A dramatic flip from "Ice House" to "Hot House" occurred 635 million years ago. Methane Hydrates by Miriam Kastner: Natural Hazard or Natural Resource ? Humans are now in charge of Climate Change - Other species depends on us. A small rudder can keep a big ship on a safe path - so can the climate be balanced by humans. Understand the tipping points. Action is too late beyond the point of no return. Grandchildren May Inherit 'Hot House' Planet if we are past the point of no return. "Hot House" is just old days in earths history. More Infra Red Light is radiated from "Hot House Earth". It will establish a new balance in the energy budget. The "Overpopulation" problem is solved by natural regulation. As before some species will survive. How can focus be switched from day to day news to the real problems such as extinction ? Enjoy life while you can. Humans has Overpopulated the Earth. However our brain may solve the climate problem in the last minute. Feedback Dynamics and the Acceleration of Climate Change. - video. TAO - Temp - Map of Antarctica. Key Indicators. Latest from James Hansen , Archer - How Can We Avert Dangerous Climate Change - Plan B.